'Marpa' 2001 refers to some of the country of Lucy's grandparents. This country is known as Marpa, after the central rockhole shown here, and is located in the southern Great Sandy Desert. This is important women's country, who are shown throughout the painting, coming here for ceremony. The dot work throughout the painting represents some of the food available at Marpa, in particular, kantilli or bush raisin. The desert oak, or kurkapi, is also found here and depicted as the three solid bands of colour. The majority of the painting depicts tali or sand dunes which dominate the landscape of the area. Yukenbarri's husband is Helicopter Tjungurrayi who is also a Warlayirti artist. Jill Sykes, Look , 'Mollie Gowing: celebration of a passionate and generous enthusiast', pg. 28-29, Sydney, Dec 2006-Jan 2007, 29 (colour illus.). 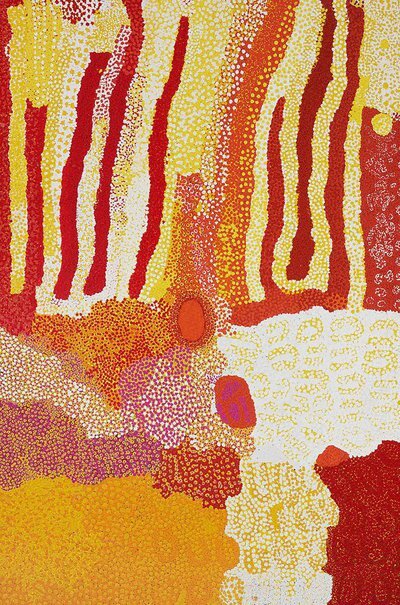 Christine Watson, One sun one moon: Aboriginal art in Australia , ‘Wirrimanu: Meeting place’, pg. 219-227, Sydney, 2007, 214 (colour illus. ).